Ever since I was young, I've loved mysteries. Didn't matter whether it was Nancy Drew or Scooby Doo or even Unsolved Mysteries, I loved it all. My second grade teacher had us keep a daily journal and in it she would sometimes give us a writing prompt, but more often she'd let us write whatever we wanted, so I would write short stories. I even had different pictures I would draw in the corner to correspond with what kind of story it was: a ghost for a horror story, a heart for romance, a wizard's hat for fantasy and a magnifying glass with footprints for a mystery. Those were the majority of my journal entries. Something about twists and pulling the rug out from under people appealed to my 7 year old self. 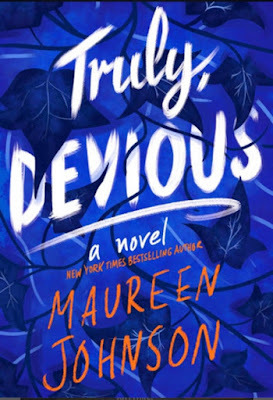 And it still is something I enjoy, which is why I loved Truly, Devious by Maureen Johnson so much. The story takes place at Ellingham Academy, a famous private school in Vermont which caters to only the brightest thinkers, builders, and creators. The academy was founded in the 1930s by the famous tycoon Albert Ellingham, who wanted to make a grand place full of riddles, twisted pathways and gardens. He wanted a place for kids to learn and play; he wanted to build a place "where learning is a game." Not too long after the school opened, Albert's wife and daughter were kidnapped and a young student was killed. The only clue left behind was a poem listing different ways for murder that was made out of cut out magazine letters signed with the pseudonym Truly, Devious. The Ellingham case became one of the greatest unsolved crimes of American history. Now, in present day, true-crime aficionado Stevie Bell is about to start her first year at Ellingham Academy and the biggest thing on her checklist is solving this long cold case. But first she has to figure out how to navigate her rigorous class schedule and house mates. When tragedy strikes and death returns to Ellingham, Stevie has to rely on her deductive instincts before Truly Devious gets away with murder again. I really enjoyed this book. It was fast paced and really drew you in. The characters are well rounded and you feel as if you're part of this murder mystery. I found myself picking out clues throughout and trying to be like Stevie and ferreting out who could've been responsible. Johnson ties the original Elligham case and the present case neatly together so that way the different points of view between the two never felt disjointed or misplaced. The whole thing just flowed together. Be aware that the book does end on a cliffhanger and what a cliffhanger it is! I can't wait to see how the story plays out. If you're a fan of mysteries or just need a fast paced action filled story, I'd definitely recommend checking this one out. Adding to my goodreads ! Thanks! Right? The cover's so nice. I love the blue.